Despite upgrading Rishabh Pant to a Grade A contract, and appointing him the No. 1 wicketkeeper in Tests for Indian cricket team, the BCCI selection committee has not selected him for the ICC World Cup, opting for Dinesh Karthik instead. 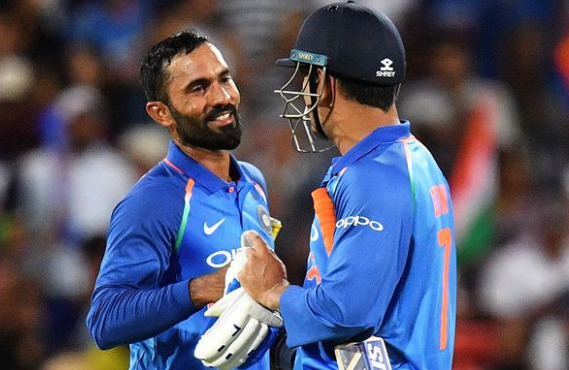 Dinesh Karthik, who has not had a great run in the ongoing Indian Premier League (IPL), will be the second wicket-keeper in the Indian cricket team for the ICC World Cup, after MS Dhoni. The selectors have opted for Dinesh Karthik’s experience instead of the young and exciting Rishabh Pant to fill the second wicket-keeper’s spot in the Indian cricket team for the upcoming ICC World Cup in England and Wales. The five-member selection committee — led by MSK Prasad — skipper Virat Kohli and coach Ravi Shastri met in Mumbai on April 15 and picked the 15-member squad for the marquee tournament, selecting a side which many had predicted. Young Tamil Nadu batting allrounder Vijay Shankar has got the nod, possibly as the No. 4 batsman, though it is highly likely that KL Rahul, in hot form recently, would feature in that position. Ravindra Jadeja has been picked as the third spinner, the selectors opting to not carry a fourth pacer for England. Skipper Virat Kohli, Rohit Sharma, Shikhar Dhawan, Dhoni, Kedar Jadhav, Hardik Pandya, Kuldeep Yadav, Yuzvendra Chahal, Bhuvneshwar Kumar, Mohammed Shami and Jasprit Bumrah picked themselves on the back of some consistent show in recent times. The selectors basically deliberated on three grey areas: The much-debated No. 4 slot, whether Pant or Karthik will get the green flag as the second wicket-keeper, and whether the team will pick a fourth pacer or an additional spinner. The team management and selectors have often spoken about continuity and that is exactly what they have done with regards to the team for the World Cup. They have tried Shankar at the top and have backed him in the squad. The iffy decision is Karthik’s selection ahead of Pant, who is the first choice Test wicketkeeper. Besides, Karthik has been in poor form of late. The Tamil Nadu player is in the squad as back-up for Dhoni, and, in all likelihood, will be benched through the tournament. If that was the case, letting a young player like Pant be part of the squad — giving him valuable experience being in and around a big tournament — would have augured well for the future. One can’t help up wonder whether it has something to do with the ‘zonal quotas’. Considering that the wickets in England in June-July, the time when the World Cup will be staged, will be on the slower side, the decision to take Jadeja on board looks sensible. Besides, Jadeja has been in good form for his IPL side Chennai Super Kings (CSK). He will also bring solidity to the lower end of the batting line-up and his fielding prowess is always an asset. Pandya, having missed the series against Australia, due to issues with his core, is back to full fitness and fits in as the all-rounder who will also play the role of a finisher. While both Prasad and captain Kohli made it amply clear that players' performance in the IPL would not be considered, sources have told IANS that it was indeed difficult to ignore some of the breathtaking knocks played in the league by the likes of Rahul.